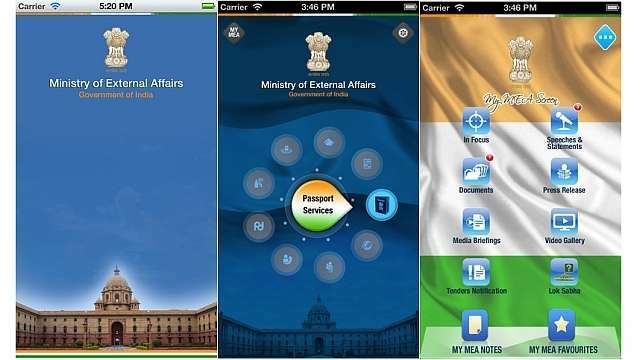 Now getting information about the Passport services, visa services/consular services, Indian Missions abroad, E-Citizen, Media Centre and following our PM has become easy with the Ministry of External Affairs (MEA) launching a full fledged App both for iOS and Android devices. The App is rather basic but gives useful information which is decently sorted out. You can also get information about the Manasarovar Yatra or Hajj Pilgrimage on this App. The App has a scroll wheel which gives you options like Passport Services, Follow PRM/EAM, Haj, E-Citizen, Media Centre, Public Diplomacy, Indian Missions Abroad, Visa/Consular Services, Kailash Mansavorar Yatra. To view a particular service, you have to just tap on the option and view the same. The interface is simple and gives you the information you need. You have to select the option you want to see. For example tapping "Passport Services" will give you basic knowledge of instructions for obtaining a Indian National Passport and the Passport Seva Kendra's near you, tracking you application and downloading the forms. You can also customize the home screen with your own choice of options. To create your own screen, you have to click on the edit button at the top right corner to select the options you did like on your screen. You can also add your own background image to the screen.